Running numbers: 4200 - 4299, 5200 - 5264. 1940 (5255 - 5264) to lot number 329. The '4200' class of locomotives were the first 2 - 8 - 0 tank engines in to be used in Britain and although the Churchward Standard plan of 1906 included a 2 - 8 - 2 tank, it was feared that the wheelbase of such an engine was too long for the areas that it would serve. A prototype 2 - 8 - 0T was built, number 4201, that shared a number of parts similar to the '2800' heavy freight locomotives. The main difference between the classes was the use of a standard number 4 boiler instead of number 1 and in the purpose of the design which was for hauling heavy mineral traffic in South Wales, usually coal from the pits to the ports. The second and third driving wheels were fitted with thinner flanges, similar to the '2800's, but the coupling rods had spherical joints between the third and last pair of driving wheels giving some amount of side play and these arrangements allowed the class to negotiate curves down to 2 chains, or 66 feet, in radius. When built, the prototype had a straight backed bunker with a coal capacity of three tons and was not fitted with top feed. In this condition, number 4201 ran for 14 months proving the success of the design. The first production batch of the class was slightly modified to the initial member in that top feed was fitted as standard and the rear edge of the bunker was extended to increase the coal capacity to 3½ tons. The engines proved such a success that production continued up to 4299, then from 5200 to 5204 before number 4200 was built in February 1923 to complete the first phase of the '4200' class. When more locomotives were required, the class received it's first major modification in that the cylinder diameter was increased from 18½ inches to 19 inches and so increasing the tractive effort to 33,170 pounds. 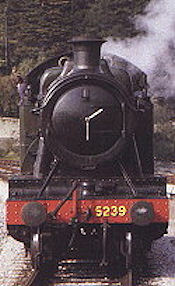 Due to this change, the series of engines built from number 5205 are usually referred to as the '5205' class and were easily identified as outside steam pipes were fitted as standard on this class. Production continued through to April 1926 with the building of number 5274, to the last batch created prior to the Second World War of numbers 5275 to 5294. While this batch was being built, a reduction in coal exports caused many of the class to lie idle since their coal capacity precluded them from other work on the rail system, and so these engines were placed into storage at Swindon. 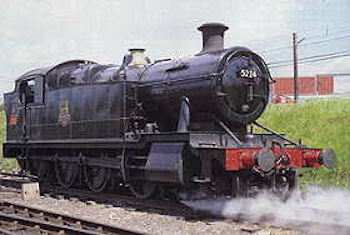 Charles Collett took the decision to alter this batch to 2 - 8 - 2T configuration by simply adding a bolt-on extension at the rear which included a trailing wheel. This modification extended their coal capacity up to 6 tons with the water tanks increased to 2500 gallons. This was the formation of the '7200' class. When the Operating Department required additional engines of the '7200' class, the last 20 engines still in service, numbers 5255 to 5274, were rebuilt as 2 - 8 - 2T's, however, due to the excellent record of these rebuilds, again the Operating Department required additional members to this class. 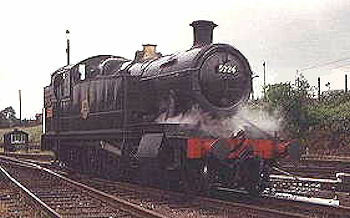 The engines selected for these rebuilds were from the earlier Churchward '4200' series, however, due to their age, extensive reconstruction was needed. Ironically, when the last of these '4200' class were rebuilt as 2 - 8 - 2T's in December 1939, production of the '5205' class began again with the building of numbers 5255 to 5264 from January until March 1940. As previously mentioned, the coal capacity had been increased to 3½ tons from the first production batch, but from 1919 the bunker was built six inches longer, increasing the amount of coal to 4 tons. Also in this year, engines from number 4262 were fitted with a cast iron chimney and previous members of the class were so fitted. When new cylinders were required on the '4200' engines, outside steam pips were also fitted, however some engines at this time were given a curved front frame which included raising the height of the cylinder and therefore raising the running plate above the cylinder. This modification meant that the centreline of the cylinder was 2½ inches above the centre of the driving wheels, but not all engines were modified in this way. Similarly, some members of the '5205' class fitted with outside steam pipes as standard had a flat running plate whereas most engines of this series had raised cylinders and therefore a raised running plate. As an example of the sterling service that these engines gave, all members except those rebuilt to 2 - 8 - 2T design passed into British Railways hands and in fact the engine withdrawn was number 4224 in February 1959. 18 locomotives were still working at the beginning of the last full year of GWR steam in 1965, the last engine in traffic was number 4268, withdrawn in August of that year. Five examples of the '4200' class and three members of the '5205' class have been preserved and they are numbers 4247, 4248, 4253, 4270, 4277, 5224, 5227 and 5239. Of course, if you include three locomotives preserved from the '7200' class which were rebuilds of the '5205' series, the list would add 5264 (rebuilt as 7229), 5275 (rebuilt as 7202) and 5277 (rebuilt as the pioneer of the '7200' class, number 7200).